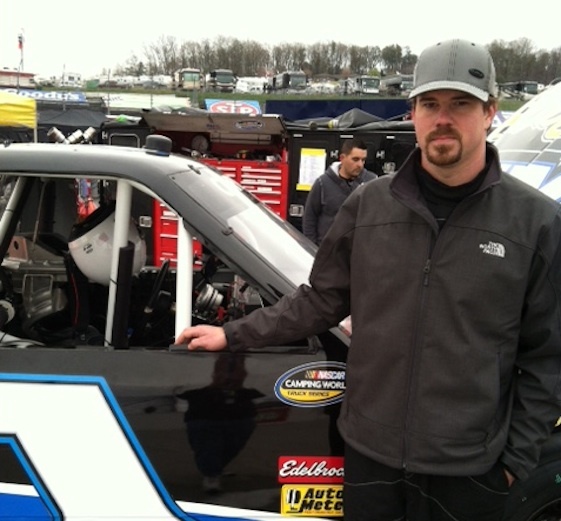 Jonathan Davenport hopes to make his Camping World Truck Series debut this weekend. But Blairsville, Ga. native Jonathan Davenport’s first crack at NASCAR might be the more intriguing story. His first mission Friday morning was to seek out advice from a veteran driver. “I was over there talking to Matt Crafton,” Davenport said about 30 minutes prior to the start of practice. “He was trying to give me some pointers, what to do and what not to do. Elliott has been turning laps around asphalt tracks around the nation for the past several years, including Gresham Motorsports Park in Jefferson, Ga. on Saturday night when he won the Pro Late Model feature. Davenport, on the other hand, has been terrorizing dirt track bull rings in his Super Late Model. His win in Saturday night’s Carolina Crown at Lancaster Motor Speedway in Lancaster, S.C. left Davenport with a career-best $30,000 payday. Just over a decade ago, Davenport was considered one of the top young talents on asphalt as he cut his racing teeth at Lanier National Speedway near Atlanta. But he made the move to dirt and wasted little time finding success. Davenport’s two biggest wins have come in the World Finals on the Dirt Track at Charlotte Motor Speedway. He is the early-season leader in points in the Southern All Star Series and has won two of the circuit’s first four races this season. Assuming that he makes this weekend’s show at Martinsville on speed, Davenport will miss Saturday night’s SAS feature at Tazewell Speedway in Tazewell, Tenn. Following a decade of running exclusively on dirt, Davenport’s biggest challenge might just be trying to regain the feel of racing on pavement. The 29-year-old Davenport, who now resides in Clemmons, N.C., and Elliott were neighbors briefly in Blairsville several years ago. But oddly enough, the two have never met. They will go their separate ways again following this weekend, though Davenport didn’t rule out a possible return to the truck series later this season, including the dirt race at Eldora Speedway this summer. So what are Davenport’s expectations for Saturday?